I think everyone has waited long enough for installation photos from Tobaron Waxman’s performance, Block of Ice +1/60, a new media performance-based installation that took place at Peacock Visual Arts as part of No Time to Lose. Thanks for your patience =-). Can you work even while you are asleep? 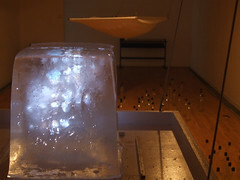 Artist Tobaron Waxman proves with Block of Ice + 1/60, that he can. 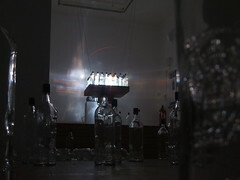 His live art performance connecting labour and water ecology is the final part of ‘No Time to Lose’, an exhibition exploring the theme of ‘overwork’. While the artist sleeps, biofeedback from his brainwaves are monitored in a process allowing him to pull images from the internet. 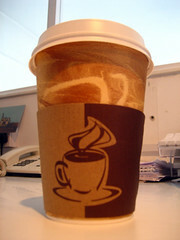 The images are subsequently projected onto a block of ice as it melts over the course of the week. Passing through a filtration system the ice melts into bottles while, at the same time, screen captures of the projection are printed onto labels. Upon waking at night, the artist begins his ‘working day’ by applying the labels to each bottle thus generating an artist’s multiple. 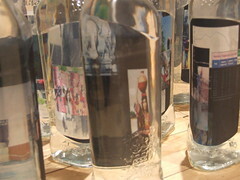 The bottles are a unique edition for sale, with proceeds going to not-for-profits concerned with labour and hydrology. Block of Ice +1/60 reveals the boundaries between social and personal experiences of ‘schedule’ and the notion of 9 to 5 as the minimum “respectable” work hours. It’s an image juxtaposing the ecology of work opposite the fragile balance of the water table. Larger images can be found in my flickr photostream. but I can’t get that embedded into WordPress. But you could go to YouTube directly and choose “480p” below the video here and here. 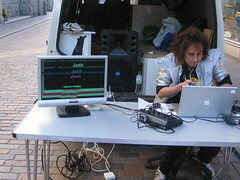 A VISUAL artist who questions why modern technology is making us all work harder performed a new work on the streets of Aberdeen yesterday. 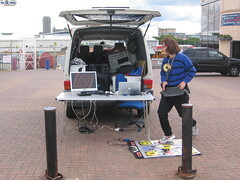 Amy Alexander, aka VJ Ubergeek, was in the city presenting her CyberSpaceLand project to unsuspecting passers-by. 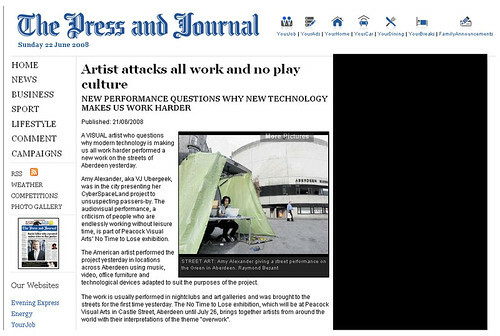 The audiovisual performance, a criticism of people who are endlessly working without leisure time, is part of Peacock Visual Arts’ No Time to Lose exhibition. 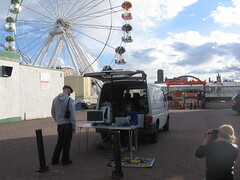 The American artist performed the project yesterday in locations across Aberdeen using music, video, office furniture and technological devices adapted to suit the purposes of the project. The work is usually performed in nightclubs and art galleries and was brought to the streets for the first time yesterday. 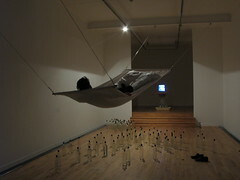 The No Time to Lose exhibition, which will be at Peacock Visual Arts in Castle Street, Aberdeen until July 26, brings together artists from around the world with their interpretations of the theme “overwork”. Between four power sanders and five power people, we got through those desks in no time flat! I suspect they are already being painted. Anja and Anja returned from “Roam/Stay” with a collection of drawings, recordings, notes, and photographs. They would have loved to spend more time engaged in these actions and interactions but, unfortunately, the clock is ticking away and there is still much for them to accomplish before the exhibition opens on Thursday. I just received an email from Cathy… all is going very well. 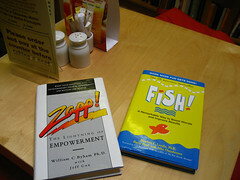 She has acquired plenty of books and other materials, and the library staff are being tremendously helpful. It’s fantastic that they are so interested in her project! Whoo hoo! Abby will be arriving by train at approx. 5 p.m. I’m looking forward to having the “NTTL Phase 1” gang altogether, and of course, everyone is looking forward to meeting her, as well :). Her office cubicle is in place, a desk and chair have been sourced, Jack seems to have the computer kiosk software in order, and now for the fun part: decorating! We’ll probably really get at that tomorrow. Monika has finished the brochure, and now I’m going to look over the label text. A couple of media appointments have been scheduled for tomorrow, and John de Graaf of the fantastic North American organization, Take Back Your Time, has so kindly informed me that news about our exhibition will be released as part of the next newsletter, which will be circulated soon! Anja + Anja are out performing “Roam/Stray”, a project that involves rides around town on public transit in order to initiate conversations with/observations of people who appear stressed out, or who are working while on the go. 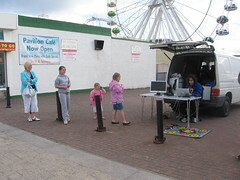 The artists will speak to people about how they maintain space between their working lives and their personal lives. With permission, they will audio-record conversations. Additionally, they will take notes and photos, and draw to achieve a creative gathering of interpersonal data. This information will later be installed within the gallery space for visitors to peruse. They have already performed this action in Amsterdam and Barcelona, the cities where they reside. The data from these cities will be compiled with the data collected here in Aberdeen for an effect that will draw parallels and highlight contrasts between the pace of life in these three locations. Cathy is at the Georgina Scott Sutherland management library of the Robert Gordon University where she will begin installing her project, which juxtaposes books on contemporary human resources management with consumer care products … both being items that encourage people to push to their limits, and then some. As a note, larger versions of any images posted here can be viewed directly at our flickr page: http://www.flickr.com/photos/8201641@N02/. Oh! And yesterday Cathy informed me that she’ll be blogging directly about her project, as well. So, keep your eyes peeled for that =-). 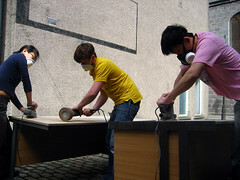 At any rate, the melamine coating on the desks are proving somewhat resilient, so it’s taking longer than we expected. 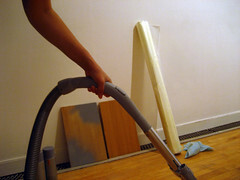 Jack is bringing in another electric sander today, so at least we’ll have two people plugging along at once. On that note, I should get downstairs! The task of sanding awaits!